All children and adult class prices are on the tuition page. This is a great class for the little one at home that loves to pretend. Little groovers runs in 3 month increments and does not have a recital. It is a creative movement class that also introduces children to a semi-structured dance class environment. They learn skills such as sharing, colors, rhythm, respect, hand eye coordination and more. Parents are encouraged to let the child participate on their own but we understand some children at this age may need some help at first. There is no recital involved in this class and they do not have to remember a routine. This class teaches basic locomotive skills with creative movement while keeping them focused through music and class participation. This class will develop muscle, coordination, flexibility and familiarize children with early dance terminology. This class is also a great way to get children used to a fun and exciting class environment. 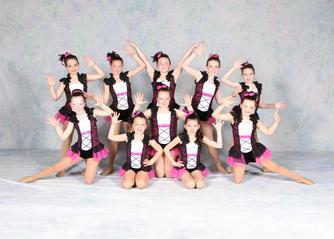 Students that have taken one year of Tip Toes Ballet can then take Ballet and Tap. 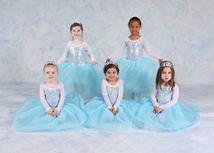 There is a recital at the studio for tip toes students and their is a costume required. For kindergarten - 2 grade children. This class expands on the skills learned in Tip Toes or is also a great beginner class for those children who have not taken dance yet. They will learn to combine steps and movement with music while enhancing their dance vocabulary. Basic Tap will also be introduced at this level.A combination class that will teach basic skills of classical ballet and tap. Each style will be broken up into 1/2 hour increments. This is a perfect class to introduce a child to different styles of dance so they can increase their knowledge. 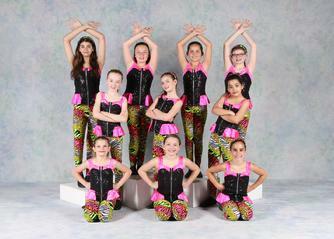 Students will participate in the year end recital and only need to purchase one costume for both styles of dance. Basic II is the next level after Basic I. All of these classes are listed as Ballet, Tap, and Jazz. A student does not have to take all three styles. For example a child that is 8 years of age with 2 years of dance experience could just sign up for Primary Tap and Jazz and not Ballet. This class is an extension of Basic Dance. Even if the student has not danced before they will learn the essentials to continue their dance education in this class. It will include traditional center work for ballet. 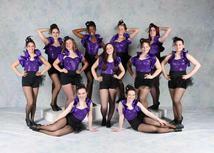 They will advance their tap skills with rhythmic music choices and develop a stronger more flexible body in jazz. Each style of dance will be 1/2 hour long. If a student does not want to take all three they do not have too, but it is strongly recommended. This class is for younger children that have either done two years of Primary dance or older children that are either in there first or second year of dance. It is very similiar to Primary but will challenge the student with more technique and start to test their ability, agility, stamina, and memory. 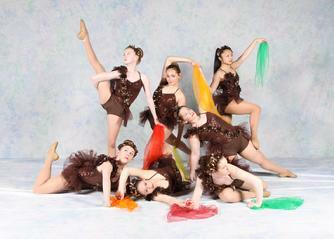 Tap 1/2 hour, Ballet 45 minutes, Jazz 1/2 hour . If a student does not want to take all three they do not have too, but it is strongly recommended. 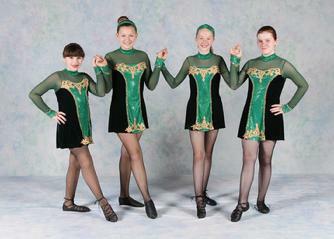 Intermediate dance is for the student that has danced before and understands basic technique. This is the class that will start to push the student to becoming an experienced versatile dancer. Turns, leaps, and jumps will be stressed in this class as well as flexibilty and more difficult choreography that will challange the student to use expression and emotion. Lyrical is based on ballet. The difference between ballet and lyrical is lyrical uses the body to express the "Lyrics" of a song. Ballet tells a story but in a more classical style. At times jazz can also be incorporated into lyrical but the important aspect of lyrical is expression and fluidity of the body. Students have to be enrolled in the appropriate ballet class in order to take Lyrical. Contemporary is the daughter of modern dance. It is a style that is allowed to break some rules. 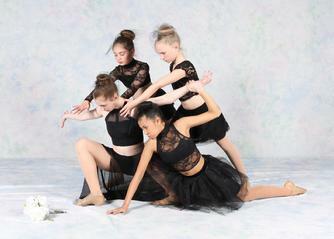 Flex the foot, bend the knee mix hip hop moves with Lyrical..why not? This style allows the student to be creative and flexible with choreography. While technique is a must in all styles of dance...Contemporary allows the dancer to be free. Students have to be enrolled in the appropriate ballet class in order to take Contemporary. Class will combine both styles for an original recital piece. Starting with break-dancing, Hip hop has become a very popular style of dance. It continues to grow and change frequently with the fads of music. All ages and all levels are welcome to take Hip Hop. They will learn choreography that is similar to those seen on MTV music videos and performed by popular recording artist and "back up" dance troupes. Students love this class because they can express themselves to music they are familiar with. Each class will be separated by age group. Don't worry parents..... music, choreography and recital costumes will be age appropriate! This class will take basic floor gymnastics and incorporate them into a choreographed routine. This class helps improve students flexibility, body control, balance, team work and agility. Any student enrolled in Acro Dance must also take Tumbling skills class. The proper class for your child is based on what tumbling skills they can execute and not always determinded by age.